Control two DisplayPort, USB-equipped PCs with a single monitor, keyboard and mouse peripheral set. 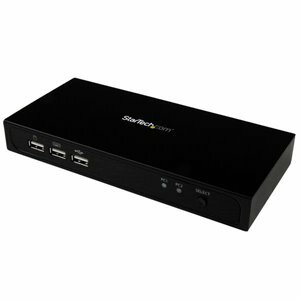 This versatile USB KVM switch lets you share a DisplayPort workstation with two computer systems, providing control of a DP monitor, keyboard & mouse, plus an additional USB peripheral device.To ensure compatibility with your setup, this KVM switch was rigorously tested with the most popular platforms including Windows, Linux and Mac computers, and is powered through your USB peripherals, meaning you won't require an external power source.With support for resolutions up to 4K at 30hz you'll be amazed at how this DisplayPort KVM flawlessly manages your graphics-intensive content. At four times the resolution of high-definition 1080p, this lossless performance makes the switch ideal solution for high-resource applications such as graphic design, CAD / CAM design, or health care imaging (MRI, radiology diagnostics, etc. ).Plus, the KVM switch also supports 1080p displays, which makes it a great accessory for home, office or other workspace applications.Featuring DisplayPort 1.1 with 7.1 digital audio, plus a 3-port USB hub for your keyboard, mouse and an additional USB peripheral device, this KVM switch is perfect for accessing two separate systems using the same workstation - ideal for server control, simplifying access to multiple computer systems.This 2-port KVM delivers effortless operation with hardware and software switching, providing a simple yet comprehensive solution for switching between each connected computer. The switching software that's included gives you on-demand switching using an intuitive video interface. Hotkey control is also available when working with Windows computers, plus the switch features an easy-to-access toggle switch located on the front.To achieve the maximum resolution of 4K at 30Hz, a video source and display that support that resolution are required. Hotkey switch commands are only supported when using Windows computers.